It’s never too late to improve your smile. More adults are having their teeth straightened. If you didn’t have orthodontic treatment as a child, you may have had problems that were left untreated like an overbite or underbite, crooked teeth or a misaligned jaw. You could be experiencing tooth decay, headaches and earaches, chewing issues or gum disease as a result. As an adult, you may have a better opportunity to get these problems fixed. Dr. Horne will tailor a treatment plan that best aligns with your expectations. Are you having jaw soreness or does your bite feel off? Feel free to give a call and schedule a complimentary consultation! Why Should I Invest In Interceptive Orthodontics? Think of interceptive orthodontics as a way to plan for the future by taking a proactive approach to orthodontic treatment. Instead of waiting for severe problems to develop and then trying to correct them, interceptive orthodontics tries to administer treatment that will prevent those problems from happening or decrease the problems significantly. Due to the fact that interceptive orthodontics is a relatively new concept, many parents are reluctant to make the investment in this type of orthodontic treatment. 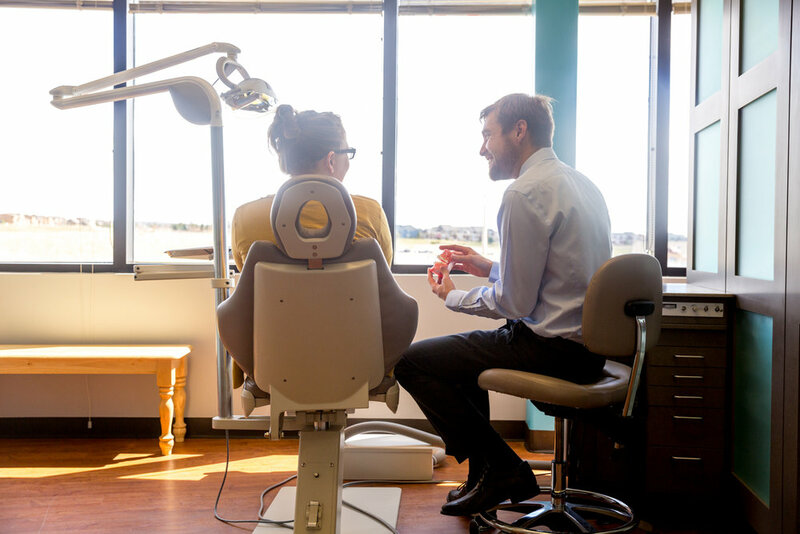 While opting to not invest in interceptive orthodontic treatment may save you some money in the short term, it could end up costing you more in the future. To help you understand why interceptive orthodontics is a good investment, we will take a closer look at what it is and some of the benefits that come with this type of orthodontic treatment. Orthodontics, which is dedicated to correcting the positions of your teeth and the alignment of your bite, can be broken up into different phases, depending on the specific situation. If a two phase plan is recommended, the first phase of orthodontic treatment is called interceptive orthodontics and involves actively working to correct the alignment and placement of your teeth before severe problems occur. Interceptive orthodontics most commonly starts around the age of 8, but can begin even sooner. Unless your dentist recommends something earlier, age 7 is the recommended age for your first orthodontic consultation because permanent teeth are usually starting to come in and orthodontists can get a general idea of how they will be aligned and placed. If your orthodontist notices a potential problem, such as teeth are coming in too close together or the bite appears misaligned, treatment can be administered to correct the problem or problems. After interceptive orthodontic treatment is complete, there is often a waiting period of a few years before your child is ready for Phase II treatment, which commonly starts when all of the permanent teeth (not including wisdom teeth) have erupted. Interceptive orthodontics can help save you money on future orthodontic treatment. By having problems corrected in their early stages, future treatment is less complex and shorter which means it costs less. In addition to saving money by shortening future orthodontic treatment time, you will be able to save money by not having to undergo so much dental work. Straight, properly aligned teeth are easier to brush and floss. Your ability to properly brush and floss from an early age can prevent a number of problems ranging from gum disease to tartar buildup and cavities. Some problems, such as protruding teeth or misaligned jaws, are extremely susceptible to injury. Interceptive orthodontics can correct the problem which may prevent injuries from occurring. Being able to prevent injuries will save you money on dental treatment and help your child not experience the pain that can come with some dental injuries. See if your child is a candidate for interceptive orthodontics by scheduling an appointment at Reddick Orthodontics in Melbourne, Florida. Dr. Reddick will assess your child’s case and determine if interceptive orthodontics is needed. Assessments for interceptive orthodontics should occur between the ages of 7 and 10. Not every child will need interceptive treatment. Interceptive orthodontic treatment will only be recommended if Dr. Reddick feels it will save you money on future treatment, decrease treatment time for future orthodontic treatment, prevent the need to extract teeth in the future or reduce chances of injury. This past weekend we spent some time at Relay for life!